Influencer marketing has existed in the advertising world for a while now and because the number of brands investing in influencer campaigns is increasing day by day, it has continued to not only evolve, but lead within the realm of marketing. A decrease in the number of people watching TV and the rise of ad blockers are increasing the growth of this industry, thus affirming that word of mouth is a highly efficient kind of marketing in this digital age. Today the question is not “What is influencer marketing?” but “Where is influencer marketing heading to?” In this article, I will explain the ways in which AI is revolutionizing influencer marketing efforts. There are a few problems associated with influencer marketing. Let’s have a look at them now. Social media is becoming increasingly image- and video-based due to the growth of picture messaging apps such as Instagram and Tumblr. The majority of images shared online have no identifying text or hashtags, making them very difficult to track. The only way to accurately identify these posts is by analyzing the content within the image itself. The process of finding an influencer and matching their persona with your brand is a rigorous process and brands have turned to word of mouth to discover influencers. 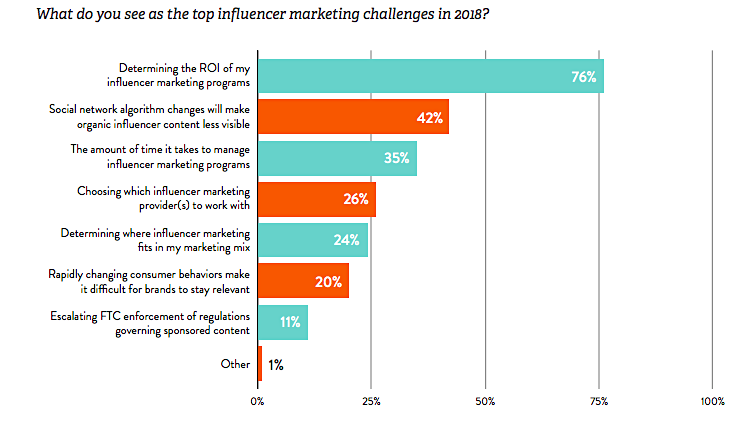 According to Rakuten Marketing’s survey of 200 UK marketers who work directly on influencer campaigns, 86% said they weren’t sure on what basis influencers charge their fees and 38% felt they were not able to tell whether the activities of their influencers drove sales or not. While influencer marketing is not perfect, it is still one of the most effective ways for brands to drive authentic online conversations and find new customers. However, a much better way to weigh and prove its worth is required, and artificial intelligence is providing the answer. The use of artificial intelligence in influencer marketing is gaining traction just as it is in many other business sectors. Year after year, the process of working with influencers has gradually become more automated: from influencer search to brand affinity and content analysis, AI is providing a solution for a wide range of brands’ needs. Artificial intelligence is a branch of computer science that aims to create computers or machines with the ability to do things that would usually require natural or human intelligence. Influencer marketing software and platforms often use several different types of AI. Now, let’s have a look at the ways in which AI is transforming influencer marketing. Image recognition, in the context of machine vision, is the ability of software to identify objects, places, people, writing and actions within images and it helps marketers save a considerable amount of time since the machine is able to more quickly sort through and identify images than any human. Computers can use machine vision technologies in combination with a camera and artificial intelligence software to achieve image recognition. Through computer vision, marketers can analyze millions of images and videos online in a matter of seconds and identify those with pre-determined characteristics, all at scale. This could be images containing a specific product or brand logo or, even more sophisticated, it could be the people in the image and their facial expressions. This relieves you from the headache of hiring someone to look at each image and tagging the ones that contain your product. Computer vision helps marketers identify relevant social influencers and gain a far deeper understanding of when and how their audience posts images that are related to their brand. For example, if an influencer posted an image of a new pair of Nike shoes, and that in turn was shared millions of times by their followers and other influencers, all these posts can be tracked by the brand. Computers are already capable of detecting basic image attributes, from brand logos to scenery. But the recent influencer marketing systems powered by artificial intelligence will utilize their Artificial Neural Networks (ANN) to provide insights on influencer personas by analyzing millions of image attributes, such as whether an image is inappropriate in any way, or whether similar images tend to see a lot of engagement. Using NLP, you can process every post by the influencers and analyze that data to understand how well a particular influencer fits with a brand. You can also forecast and estimate the performance of an influencer depending on the objective of a brand — which includes everything from the engagement level of each post to the number of sales conversions that each influencer drives. Thus, the process of finding influencers and determining if they are suitable for a brand becomes less resource-intensive, less time-consuming, and more accurate. 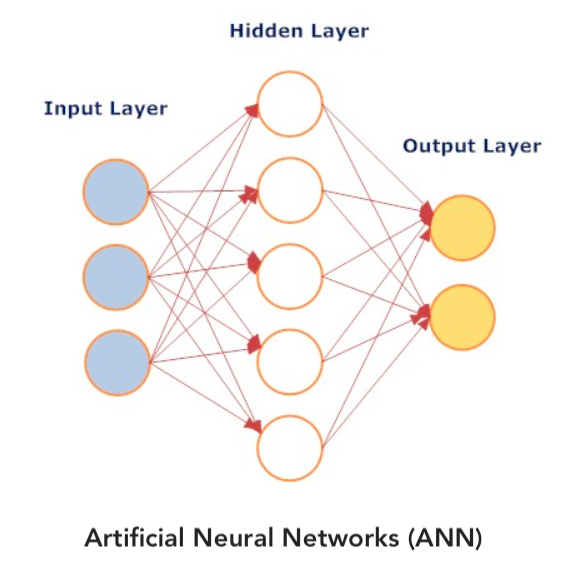 By using artificial neural networks, which are trained on historical data from numerous influencers, influencer marketing systems powered by artificial intelligence can predict what level of incentive works best to encourage influencers to post and then offer that incentive at the moment that the influencer is most likely to post. This is actually true for all types of influencers, from micro-influencers with smaller but highly engaged networks of family and friends to celebrities with huge followings. 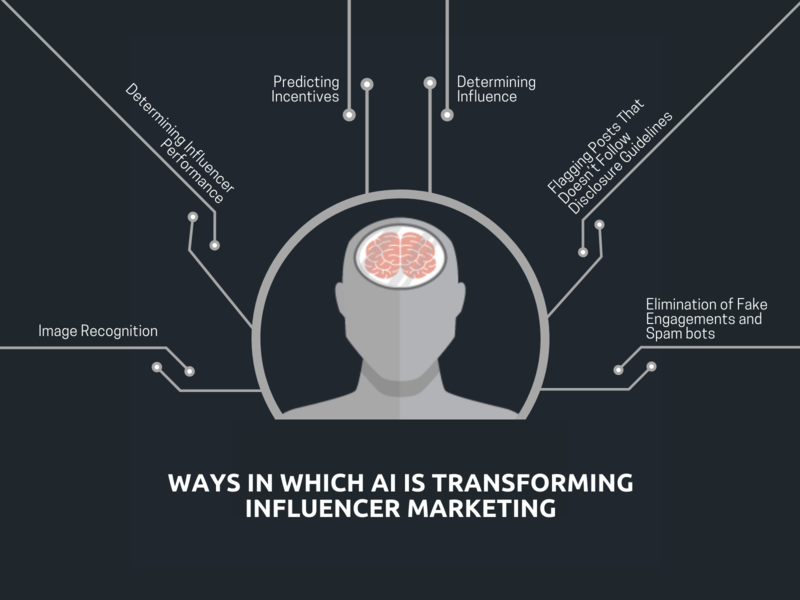 The influencer marketing systems powered by artificial intelligence won’t just re-evaluate the potential of an influencer based on performance every year or month. Having learned from all an influencer’s posts, AI-powered influencer marketing systems can understand when people are likely to experience an increase or a decrease in their influence and adjust incentives accordingly. Because AI can detect whether or not a post has a disclosure, and flag posts that don’t, it can save marketers a lot of time and headache. AI is also being used to eliminate spam bots and filter out fake and toxic engagement. In this way, artificial intelligence is helping brands determine real engagement metrics such as number of likes that their influencers get per post or the number of followers they have gained. This also helps brands better calculate the price that an influencer charges for a campaign. If you’re looking for an influencer marketing platform to help manage and scale your influencer programs, ask how they are using AI to make the programs more effective – and run the other way if it is used only to process images and data or to identify the personality type of an influencer! AI is used to return quantifiable results, so it makes influencer marketing programs highly effective. True AI platforms move beyond image processing and analyze years of influencer content in order to determine the topics and brands that influencers are talking about, audience sentiment, aesthetic style and, most importantly, how effective their content is at driving traffic, engagement and product sales. Next time you hear about a platform for influencer marketing that attempts to sell its technology driven by AI, ask in what way that AI is utilized. Is the AI built specifically to predict results, scale programs, and provide higher influencer marketing return on investment for brands? Or is the AI just a term to dress up tasks related to influencer classification? It is important to ensure that your influencer marketing efforts are both effective and brand-safe at the end of the day. While this trend is arousing curiosity among both audiences and brands, it is highly unlikely that these influencers will replace the human influencers. The biggest advantage that influencers have for brands is a trusted, personal voice. A favorite influencer’s recommendation can be analogous to a close friend’s suggestion. The influencers generated by computers may be able to offer inspiration, but they are unable to build a true personal connection with an audience. AI can sift through past performance data, assess what types of brands influencers have been associated with previously, and which influencers continuously drive high, qualified engagement around particular products or content. All of this enables advertisers to focus less on execution and more on making the right marketing strategy decisions, but a human element is certainly still required as AI lacks the creativity and ingenuity to drive a narrative. Influential is an influencer marketing platform built to produce social campaigns that deliver higher engagement and ROI. With the help of machine learning and transparent data, it enables brands to develop a close connection with their audience on social media platforms like Instagram, Twitter, Facebook and Snapchat. Influential uses IBM Watson (“a question-answering computer system capable of answering questions posed in natural language”) capabilities for selecting the right influencers, delivering meaningful engagements, campaign reporting, etc. Some of their clients include Coca-Cola, Johnson & Johnson and BMW. The automobile manufacturer Hyundai used Influential to promote its 2018 Hyundai Sonata on social media platforms. Influential built a campaign that was, once again, supported by IBM Watson and garnered nothing but positive feedback on social media. With the help of machine learning and transparent data, Influential matched the brand with over 20,000 influencers on its network and gained 15 million gross impressions. Linqia is another AI-powered influencer marketing platform that brings together influencers, brands and advertisers to create an emotional connection between brands and consumers that guarantees results. With the help of artificial intelligence, this platform examines billions of data points and uses that information to determine which influencers will deliver the goals of a brand. Linqia’s clients include 250 national brands, such as McDonald’s, Walmart and Nestle. This platform provides a centralized place where marketers can test the best-performing influencer content to drive higher ROI form their paid, owned and earned media. For spreading awareness about its brand, Nestle Pure Life was looking to connect with people who would share their heartwarming experiences on how receiving guidance from regular women who were mothers and grandmothers helped them. To do this, Nestle turned to Linqia to find the right influencers on various social media platforms such as Instagram, Facebook, Pinterest, Tumblr and Google+ who could share their personal stories and generate positive engagement. The influencers chosen by Linqia created over 7,500 social stories and got 22 million impressions and the campaign also encouraged over 50,000 audience members to share their own stories about how their mother figures have inspired them and taught them confidence. AI has slowly worked its way into influencer marketing in a big way. 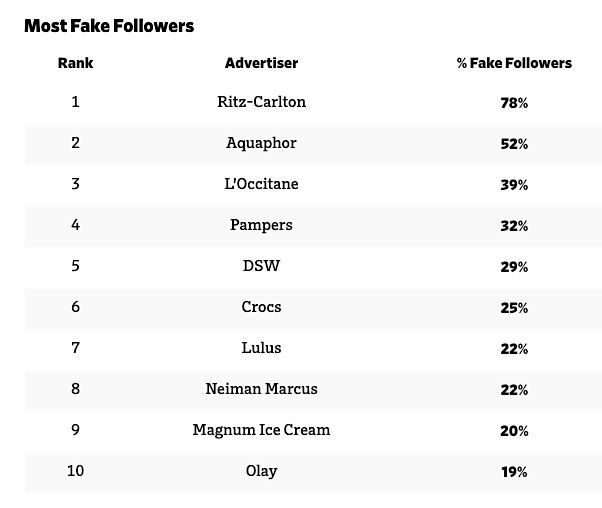 It wasn’t long ago when brands were forced to parse through lists of supposedly influential people who built their following using bots, software and shenanigans in order to determine who was authentic and who wasn’t. Those days are now over. AI-powered influencer marketing platforms help in discovering a more scientific approach to unlocking the true worth of influencer marketing. This technology offers an accurate and transparent framework for proving the return on investment that this channel has been striving for. 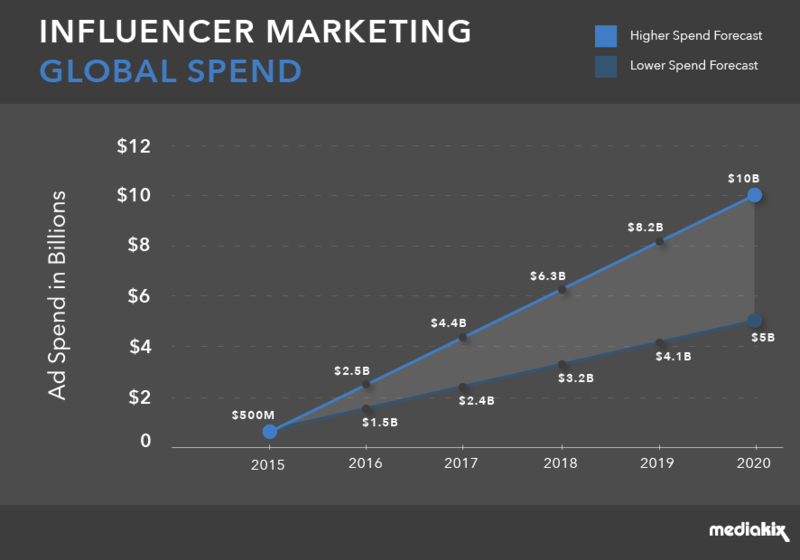 The future of influencer marketing is likely to take a similar approach to the overall rise in digital marketing over the past decade, where the best combination will stem from different algorithms working parallel to humans, to provide highly efficient campaigns for brands.